WASHINGTON -- Volkswagen of America, seeking to contain the damage from its emissions scandal, will offer to buy back some used diesel vehicles from its U.S. dealers at pre-crisis prices, Automotive News has learned. According to three dealers briefed on the plan, VW will guarantee the value of certified pre-owned and other used VWs with 2.0-liter diesel engines containing the illegal emissions software in dealer inventory, at prices seen before Sept. 18, when the EPA announced VW’s violations. 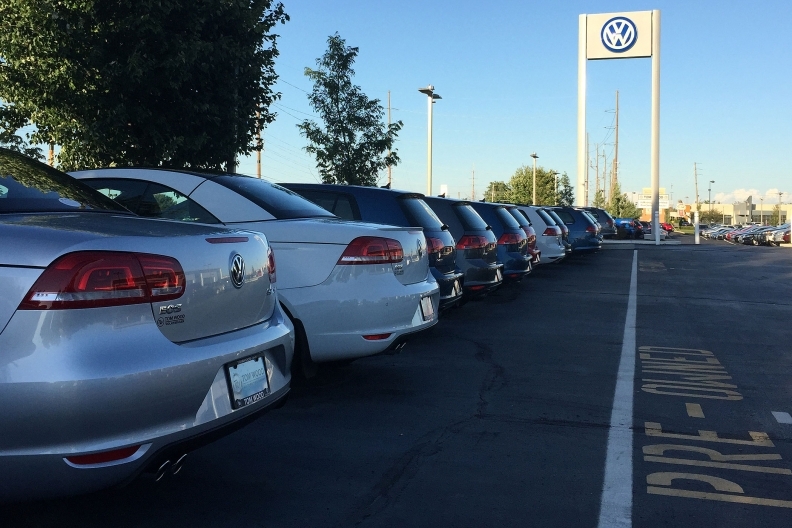 If any of those vehicles stay in dealer inventory for 60 days or longer, VW will offer to buy them back from dealers. The program will roll out in three phases, according to an Oct. 29 memo to dealers from Volkswagen of America COO Mark McNabb, starting with an inventory of diesel vehicles on dealer lots to help VW determine which ones are eligible for the program. That step is expected to be completed by Nov. 13. VW will detail the next phases of the program over the next two weeks, according to the memo. The moves seek to establish a pricing floor for used VW diesels whose wholesale prices and auction sales volume have plummeted over the past month. According to Kelley Blue Book, average auction prices of VW diesels were down nearly 16 percent through Oct. 16 compared with levels before the scandal, and auction volumes were down 25 percent. Offering dealer buybacks also gives retailers certainty that the used diesels on their lots won’t become worthless while they wait for a fix to bring the vehicles into compliance with federal emissions standards. It also will help prevent a glut of used diesels piling up at dealers, who cannot sell the 2.0-liter diesels as certified pre-owned cars but are still accepting customer trade-ins. Dealers applauded the program, which VW dealer council chairman Alan Brown said was a move encouraged by the council to ease the uncertainty surrounding the value of used VW diesels. “We felt several weeks ago that we’ve got to control the values, and the only way to do that is for VW to step in and prevent them from going to auction,” said Brown, general manager of Hendrick Volkswagen Frisco in suburban Dallas. Analysts say some volatility and uncertainty in pricing will continue until it’s known how VW plans to fix the cars, and how those fixes will affect performance and fuel economy. The buyback program was one of several initiatives announced at VW’s national dealer meeting on Oct. 22 in Orlando, according to dealers who attended. Among them, VW is crafting a “customer goodwill” program for owners of diesels affected by the scandal, the dealers said. VW executives didn’t disclose what the program would include, but dealers said VW planned to provide details in the first week of November. A VW spokeswoman declined to comment, saying the meeting was confidential between VW executives and dealers. Judging by how other manufacturers have responded to similar scandals, it’s likely that the goodwill program will include some form of compensation to owners. For example, Hyundai and Kia gave prepaid gasoline cards to owners in 2012 after the brands overstated the fuel economy ratings on several of their models. In 2013, Ford paid C-Max owners $550 after the company reduced the hybrid car’s fuel economy ratings. VW told dealers it will provide them another infusion of cash similar to the “discretionary fund” wired to dealers on Oct. 1, though it will be a smaller sum, the dealers at the meeting said. VW also told dealers that it has secured an immediate production increase of gasoline-powered Jetta, Golf, GTI and Tiguan models to offset the loss of diesel sales, which are still on hold pending EPA certification. VW said its product pipeline has been unaffected by the emissions scandal, and that major future products including the new midsize crossover, long-wheelbase Tiguan compact crossover and the Subaru-fighting Golf SportWagen Alltrack will launch on-schedule.